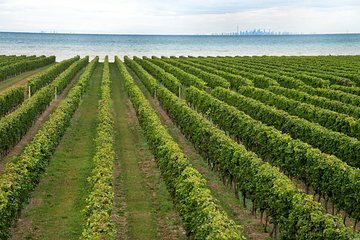 Utforska Niagara vinodlingsarv på denna 45-minuters vingårdstur i Konzelmann Estate i Niagara-on-the-Lake. Besök Konzelmann Estate vingård på den frodiga stranden av Lake Ontario. Under din 45-minuters rundtur följer du din guide genom vingården och får insikt i vinframställningsprocessen. Hör hur allt började med den tyska vinmakaren Herbert Konzelmann 1984 och lär dig av de många internationella utmärkelser som vingården har vunnit. Exempel på druvvarianter för vilka gården är känd, såsom pinot noir och merlot, och uppskattar de komplexa smakerna i ditt glas. It was a well kept from the establishment to vineyard! Our guide was well informed. Tasted three wines. Plenty to go around. Excellent tour, very professional and very interesting. Une belle visite et de bons produits. Really worth it. We were 8 on this 1 hour tour and Michael our guide was not only knowledgeable about wine but was also an excellent communicator. Although it was January the weather was great, the tour wonderful, will come back. The tour was incredibly enjoyable and although we were with two other couples we enjoyed their company and at the same time enjoyed a romantic outingtogether. The tour guide was very knowledgable an dpersonable which definitely added to the substance of the tour and overall experience. Tour is pretty short but wine is pretty good. We enjoyed our tour and Nicholas was great. We will be sure to let our family and friends taste the wine we purchased. We had a wonderful time. It was beautiful!